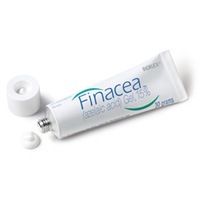 Bayer AG, owner of Intendis who make Finacea, has sued Mumbai, India’s Glenmark Generics Ltd., seeking to stop sales of a generic form of it’s Finacea gel. Bayer is Germany’s largest drugmaker. Glenmark Pharmaceuticals, a maker of generics, triggered this defensive legal move from Bayer by filing a Abbreviated New Drug Application (ANDA) for a generic form of 15% azelaic acid gel. Bayer’s related patent 6,534,070 – Composition with azelaic acid is not due to expire until 2018. Finacea had U.S. sales of about $95 million for the 12 months ending Sept. 30, according to data compiled by IMS Health, a provider of health-care information, Glenmark said. A unit of Bayer AG (BAYN), Germany’s largest drugmaker, sued India’s Glenmark Generics Ltd. seeking to stop sales of a generic form of its Finacea gel used to treat rosacea. Glenmark, based in Mumbai, is seeking U.S. Food and Drug Administration approval for a generic version of the drug before Bayer’s patent expires in 2018, according to a complaint filed yesterday in federal court in Wilmington, Delaware. Plaintiffs will suffer “irreparable harm for which they have no adequate remedy at law” unless Glenmark is prohibited from using the technology before the patent expires, Bayer said in court papers. The District Court has declared that Glenmark’s generic Finacea would indeed infringe upon Bayer Healthcare’s Finacea patent. Drug firm Glenmark’s patent plea for generic skin care drug has been rejected by a US court saying that it infinges upon the patent of Bayer Healthcare. The US District Court of Delaware at Wilmington, has said that claims of Bayer Healthcare Pharmaceuticals Inc, Intendis and Intraserv’s litigation for Bayer’s Finacea, a gel for treating the common skin condition rosacea against Glenmark is valid. The court came to the conclusion that Glenmark had infringed the “070 patent” of the plaintiffs and “that asserted claims of 070 patents are valid “and ordered the judgement in favour of Bayer and other plaintiffs. The companies had filed a case against Glenmark in 2013 after it had filled an Abbreviated New Drug Application (ANDA) seeking to market a generic azelaic acid hydrogel in 2012. On appeal, the courts have reaffirmed that Glenmark’s proposed generic formulation of Finacea is equivalent to Finacea and cannot be sold until the expiration of the Finacea patents in 2018. The Federal Circuit on Monday affirmed a lower court’s ruling that Glenmark infringed a Bayer Healthcare patent for the rosacea treatment Finacea, keeping Glenmark’s planned generic version off the market until the patent expires in 2018. The appeals court held that U.S. District Judge Sue L. Robinson did not err in any of the findings in her 2015 decision, including that Glenmark Pharmaceuticals Ltd. infringed under the doctrine of equivalents and that the patent is not invalid. Not sure why Bayer is suing anybody..?? Ego Pharmacies (Victoria) have been manufacturing AZclear action for years.. Only diff is they incorporate a much healthier portion of Azelaic Acid.20%..It would appear that Ego will shortly be producing a tinted version of their Azclear.. I am using a similar version at the time..pitanjara. Yes it does seem to be a lot of fuss over little, especially for Australians who can get Ego’s Azclear Action Medicated Lotion at the pharmacy. For the rest of the world though, a doctor’s prescription is needed – and the cost for a tube can be in the hundreds of dollars !